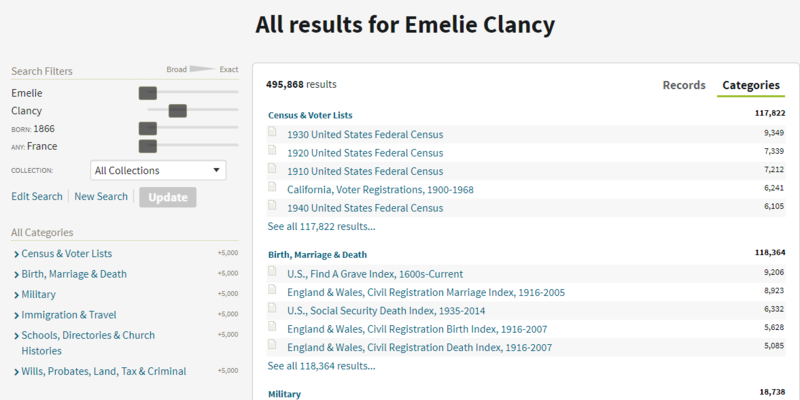 The results of your search will be displayed by type of source material, and sorted within the collections by descending number of matches with your searched name. To the left side of the page will be the Exact Matching Sliders option which displays the search criteria and limits employed in the executed search as well as the Edit Search, New Search, and Update options. Use the sliders to make modifications to the search and click the Update button to refine the results accordingly (see the next box on the page for more information about the sliders). The Edit Search link will allow for additional information to be added to the search criteria. The New search link will redirect the page to a blank search page. Also found on the left side of the results page is the All Categories area, which lists the categories that produced results along with the number of hits in each category. Clicking on a specific category will refine the listed results in the center of the page and provide more specific sub-categories to continue the narrowing process (see below). 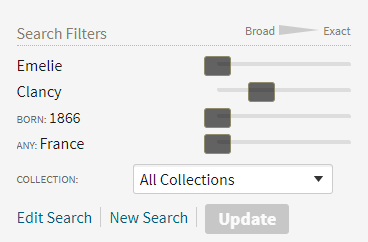 When a dataset with results of interest is located, click on the title to access more in-depth details about the individual hits in that collection. 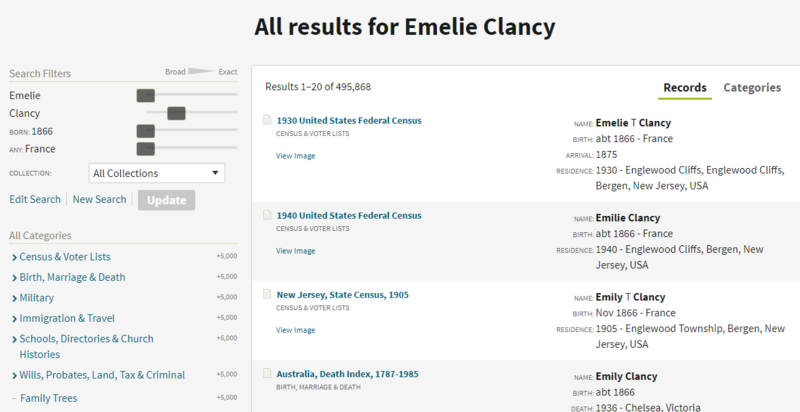 To vet the individual records, float the cursor over the title to view the Preview lightbox, giving more details about that unique record. Once a specific record is located, click on the title link to view the complete record and access other options, including the “View Original” link which opens the image viewer when an image is available for the specific record. Too many results? Too few results? Just not finding what you are looking for? Adjust one or more sliders left-to-right and click "Update" to refine your results. Sliding the slider to the right will add specificity to your results, or make the results more exact, while moving the slider to the left will broaden the results. NOTE: Sliders can be used in conjunction with the All Categories facets to further refine your results. TIP: Use the Advanced Search page exact match options to add precision to your search. If your results still need refining, the sliders and narrowing facets will be available!